By all appearances, over the past month every Republican in D.C. became a card-carrying member of the ACLU. For decades, mainstream conservatives had argued that public safety must take precedence over civil liberties — even if that meant empowering police officers to stop and frisk citizens without a warrant, or even, to shoot ostensibly threatening criminal suspects dead. But in the weeks since Christine Blasey Ford publicly accused Brett Kavanaugh of sexually assaulting her as a teenager, Republicans have developed an almost fanatical commitment to the rights of the accused. So: Republicans now believe that punishing a person for a crime he did not commit is such an intolerable evil, America cannot so much as deny a man a lifetime appointment to the Supreme Court on the basis of sexual assault allegations that were made under oath — unless those allegations can be proven beyond a reasonable doubt; to adopt a lesser standard would be to do nothing less than eviscerate the foundations of Western civilization. Some liberals have rejected this exacting standard. Others have mocked Republicans for their sudden about-face on the rights of the accused — or else, suggested that conservatives haven’t actually become principled civil libertarians, but rather, have just been making ad hoc rationalizations for advancing the nomination of a judge whom they liked. But I believe our Republican brothers and sisters are sincere — or at least, that they deserve the benefit of the doubt. The GOP’s new views on the rights of criminal suspects might have been a source of division during the Kavanaugh hearings. But they can be a cause for bipartisan cooperation going forward. 1) The abolition of cash bail. If it is wrong to deny someone a Supreme Court seat on the basis of unproven criminal allegations, then it is surely a travesty to imprison a low-income American on that same basis. And yet, the United States is currently doing the latter on a massive scale: Tonight, hundreds of thousands of Americans will sleep in a jail cell solely because they aren’t affluent enough to post bail, and await their day in court outside of confinement. Fortunately, Bernie Sanders has already introduced a bill that prohibits money bail in federal criminal cases, offers grants to states that pursue alternative pretrial systems, and withholds federal funds from states that insist on continuing to jail criminal suspects because they’re poor. Presumably, McConnell will be bringing that legislation to the floor in the coming weeks. 2) A ban on civil asset forfeiture. Under current U.S. law, federal, state, and local law enforcement officials can permanently confiscate your car, money, house, or other property — if they suspect that someone used those possessions to commit a crime, under a process known as “civil asset forfeiture.” Critically, the government does not need to prove their suspicions; in fact, it doesn’t even need to charge anyone with a crime. Typically, Americans with significant social or financial capital don’t need to worry about suffering such expropriation; police forces know that going after well-connected citizens’ property would bring repercussions. So instead, most target the scarce possessions of the poor. There is already bipartisan opposition to this practice. After Jeff Sessions revived a federal civil asset forfeiture program last year, the House passed several amendments blocking the Justice Department from implementing the policy. 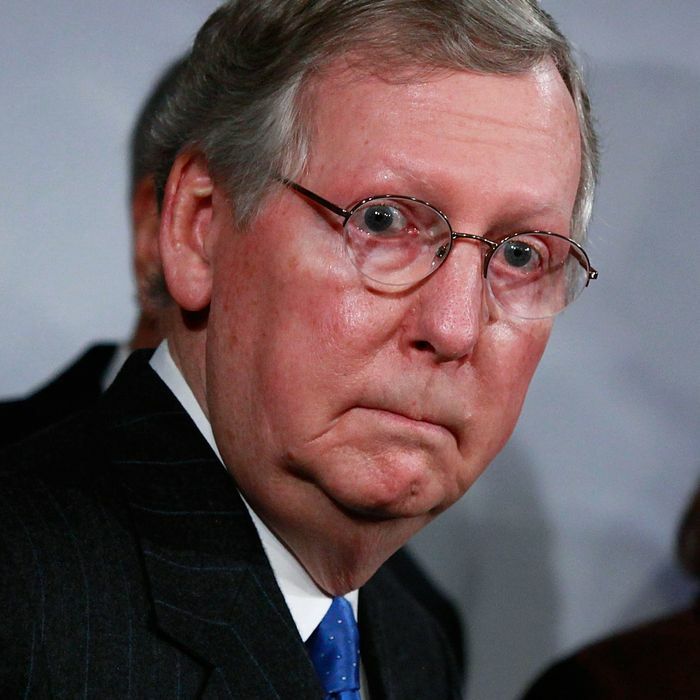 But Mitch McConnell declined to include those provisions in the Senate’s version of the omnibus spending bill. Happily, the Majority Leader has since discovered the vital importance of the presumption of innocence, and thus, it’s safe to assume he will push for a vote on those amendments — and other measures aimed at cracking down on civil asset forfeiture at the state level — in the near future. 3) The repeal of the NDAA’s provisions authorizing the indefinite detention of U.S. citizens. This one’s a no-brainer: The National Defense Authorization Act empowers the military to indefinitely imprison U.S. citizens — without charges or a trial — if the Executive branch decides that he or she has “substantially supported al-Qaeda, the Taliban, or associated forces.” If fealty to the Magna Carta required us to disbelieve Christine Blasey Ford, surely it bars the White House from having the unilateral authority to order the indefinite confinement of anyone whom it deems to be a terrorist. 4) A sharp increase in federal oversight of municipal police departments. On Barack Obama’s watch, the Justice Department looked into the practices of police departments in the cities of Chicago, Ferguson, and Baltimore — and found, in each case, that law enforcement in those municipalities was routinely violating the constitutional rights of residents by subjecting them to unlawful stops and excessive use of force. If due process requires us to assume that a man accused by multiple women of sexual misconduct is innocent, then surely it requires police officers to make that same presumption about African-American adolescents who’ve been accused of no crime save loitering in a “bad” part of town. And yet, despite overwhelming evidence that American cops are denying black teenagers their presumption of innocence, Jeff Sessions has suspended the DOJ’s probes of local police departments. Surely, Senate Republicans will imminently pass a resolution imploring the Justice Department to resume those investigation — and then, set about crafting federal legislation aimed at discouraging police officers from engaging in racial profiling, unwarranted seizures, excessive use of force, or any other tactic that infringes on their constituents’ presumption of innocence. The past week has left many liberals feeling bitter, and more alienated from their Republican countrymen than ever before. But they should take solace in the fact that Brett Kavanaugh’s confirmation has cleared the way for a variety of vital criminal-justice reforms. After all, to believe that Republicans will just carry on allowing the institution of cash bail to keep hundreds of thousands of poor Americans behind bars, or the Justice Department to permanently confiscate the property of criminal suspects, or the Executive branch to retain the right to indefinitely detain citizens without trial, or police departments to routinely harass and brutalize Americans who’ve been convicted of no crime — after conservatives spent the past month insisting that the very survival of “due process” in the United States required Brett Kavanaugh’s confirmation to the Supreme Court — would be to believe that the GOP is not actually invested in the presumption of innocence, but merely in the impunity of its own elites. And before we accept the truth of a charge that serious, we need to wait for Republicans to prove themselves guilty beyond a reasonable doubt.